First up, we talk about Bloodborne (which I’ve finally finished), Danganronpa (which Maddy’s almost finished), and the many games Kirk is playing, like The Division 2 and Ape Out. There’s news of the week (36:13) on Pokemon, Anthem crashing PS4s, and THQ Nordic’s major screw-up. 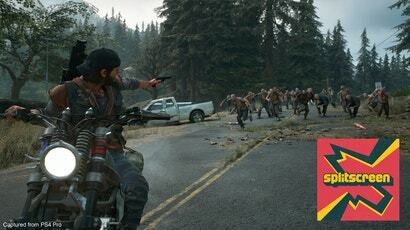 Then I share some impressions of the upcoming zombie game Days Gone, which is pretty much a hodgepodge of every AAA video game mechanic you can think of (more below). We close with some off-topic talk (59:16) on Killing Eve, The Marvellous Mrs. Maisel, and Big Mouth, followed by Kirk’s music pick of the week and a brief Russian Doll spoilercast. Jason: So a couple of weeks ago, I went to an event in New York where they set up some copies of Days Gone. I played about an hour and a half of it. A bit of context: Days Gone is the next big PS4 exclusive, it comes out April 26, it is developed by Sony Bend, which I believe is the only triple-A studio in your state of Oregon, Kirk. Kirk: It’s such a lovely place, oh my god. Bend, Oregon is this extremely beautiful place. If you were going to work at a triple-A game studio and toil away at the salt mines, you could do worse than Bend. Maddy: Next to a window, hopefully. Jason: If anyone at Sony Bend is listening to this and wants to invite the three of us to come out, me and Maddy will fly into Portland and do a road trip. If you think of a checklist of like, ‘What should I expect in a AAA video game,’ it’s got every single thing: It’s got the open world, the side quests, the crafting, the skill wheel you can open up and then you can pick different things—create healing bandages, use those—it’s got the zombies you can sneak up on, the town outposts where you can do side quests and go shopping and trade in stuff you found in the wild. It’s got the list of side quests you have to do, and go around the world filling checklists and destroying things. Maddy: Are there audio logs, though? Maddy: I heard it was so good, and I keep meaning to go check it out, because that game has a cult following. Jason: Well it’s very much like this, it’s the collection of triple-A things. Kirk: Yeah, it’s very much Triple-A Video Games, the Video Game. It is good, I’ve played enough of it. And it was a game that kind of got written off by critics, and then the people who liked it were like, ‘Hey wait a minute, this game was really fun, I played it for 40 hours filling up all the bars and unlocking all the little things on the map.’ It sounds sort of similar. Jason: Yeah. So this, I feel is going to have a similar reception. A couple of things worth noting. One is that the story is surprisingly well done—I was really impressed by the writing and the acting. Maddy: You felt really bad when the wife died? Like, really bad. Jason: Well, you don’t actually see her die. So a little bit of context here. The demo doesn’t actually show everything. The first thing I saw was your main dude is escaping someplace, and there’s a chopper coming, and his wife is hurt, so he puts her on the chopper. Then his friend is left behind, and the chopper can only fit two people, so he decides not to go with her and instead to stay behind with his friend and fight off zombies. Then it cuts to the future, and it says ‘A few months later.’ Then you find out through context that his wife died at some point. And I don’t know if that’s actually what happens in the game, or if it just skipped ahead story stuff for me for the demo. Maddy: For all we know, later in the game she’ll still be alive. Kirk: Or she’ll be a zombie. She’ll come back, and he’ll become a zombie. And then it’ll be a “zombie biker” game. Maddy: She’s a zombie queen. Jason: The mission you play in the open world, you actually go to her grave... So that’s the thing, I’m intrigued to see where the story’s going. And the performances are really good. I like the main character a lot, even though he’s this typical gruff triple-A white dude biker. Kirk: Is it Troy Baker? Who plays him? He wants to be finished off before the zombies come and tear him apart. There’s this dramatic moment where you don’t know if Deacon is going to shoot him or not, and I was really hoping you’d get the choice, because it’s a video game. But no he just shoots him and it’s like aw. The cinematics are well done. The shooting is not great from what I’ve seen so far—the reticle aiming is very weird and soft and imprecise. I got into a shootout with a few dudes at one point and it was very typical cover-shooting, it didn’t feel great to shoot people. Almost like an old Uncharted. Maddy: Is it over the shoulder? Jason: Yeah, it’s all third-person. Driving around the world is pretty cool, it’s really gorgeous. You get all these grey skies. It’s set in the Pacific Northwest, so it’s very much that kind of game. Kirk: I like that my backyard has become the new cool default setting for video games. Only because it is a beautiful setting. It’s really gorgeous looking, and you get a lot of nice weather effects to use your HDR lighting or whatever, as the sun comes through the clouds. Oh Holy crap guys, PLEASE play Mad Max, I wouldn't say it was THE GREATEST GAME EVER (tm), but it was so much fun and super easy to lose yourself in. I got this free on PS plus, thinking it might be good for a couple of hours. Initially I found the driving/aiming a bit difficult but once that clicks it’s great. High speed driving with collisions add in the grapple and you sir can have shotgun to the fuel tank plus I might run those guys over. Frenetic but uniquely fun. I got the platinum trophy for it last month, great game. Way better than I expected it to be. Days Gone looks incredibly generic, but here's hoping it ends up like my experience with Mad Max. How did you go getting the platinum trophy with the latest patches making certain trophies unobtainable. Was it hard to downgrade your game and get the missing trophies? Did your save game work okay on the old version of the game? I've been playing it a lot and am worried I won't be able to plat it as the downgrade guide I read sounded pretty complicated and don't know if I have to replay the entire game to get the trophies. I wasn't even aware their were issues with trophies, I started & completed the game this year. Looking online about the issue it seems on September 2018 update 1.05 broke 2 death run races so it made the death run trophy unobtainable. Only way people could bypass it was if they had a physical disc copy & removed all updates. But as of November 2018 the massive 20 gig 1.06 update supposedly fixed the issue (& I can confirm this because I achieved the platinum on said 1.06 update). So maybe try updating your game to the latest build. I started off really excited about this game when I first saw it, then I lost interest, and now I'm starting to get a little more hyped for it again. Sounds like a fun time filler with plenty of things to do and plenty of action. I've read a few articles about this recently that sound a lot more positive than I was expecting based on what I'd previously seen. I think I've promoted this from "no interest whatsoever" to "eeeh, might get it when it's on sale". In Australia it was on sale at Harvey Norman for pre-order at $45 last week. Same with Sekiro & Rage 2. I got no idea what its like, but it could potentially by a "darksiders 1" in that it is nothing original but uniquely well polished in what it does bringing tropes and older systems together - making it great fun to play. I want it to be great fun as I really just don't have time for more than 1 game anymore thanks to life.